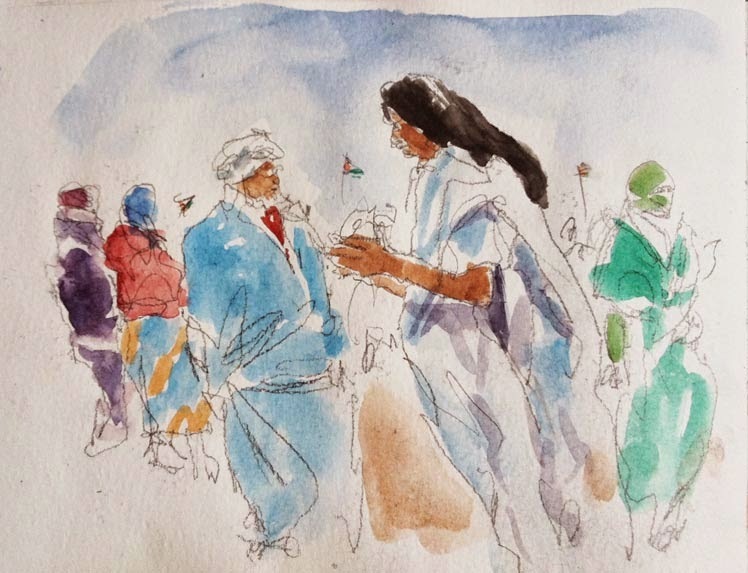 Urban Sketchers correspondent Javier de Blas arrived to Tindouf, Algeria, a few weeks ago to document everyday life in refugee camps that are home to tens of thousands of Sahrawis, as people from Western Sahara are known. These refugee camps have a long history. After Spain withdrew from the Western Sahara in 1975, Moroccan forces took control of most of the country and Sahrawis refugees fled to neighboring Algeria. 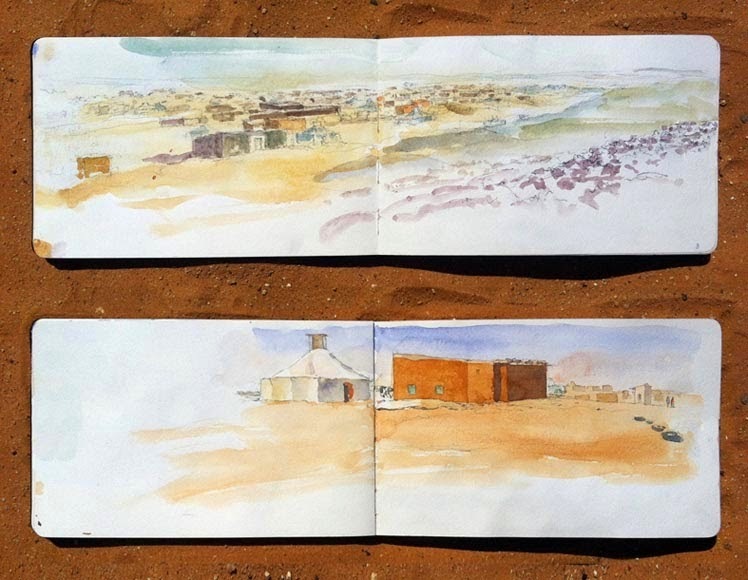 As Javier continues to publish his dispatches in the Urban Sketchers Spain blog, we'll try to translate and excerpt some posts here. You can also keep up with his live reports on his blog, Viajero en Tindouf, and by liking his Facebook page. February, 27, 2015 – Today is a national holiday. We went to Smara, the "wilaya" (that's the term used for each of several refugee camps) where the proclamation of the Sahrawi Arab Democratic Republic is being celebrated. The place was teeming with people. We saw a group of women wearing interesting black dresses with wide, x-shaped stripes. 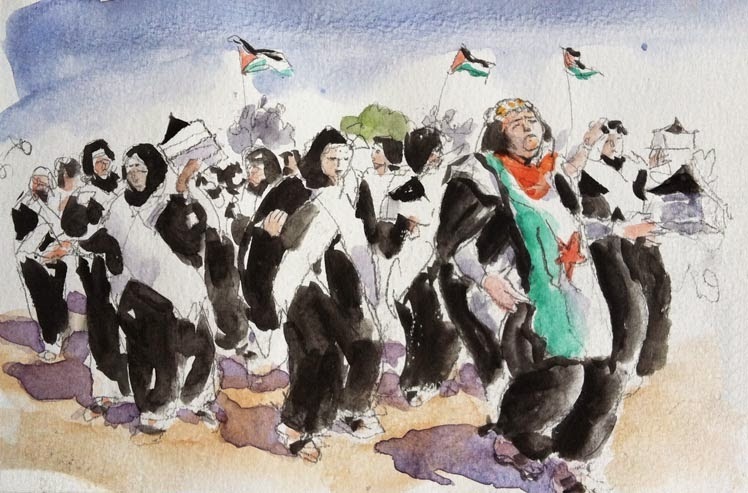 They were marching and dancing to the rythym of the type of guitars commonly used by Sahrawis and Mauritanians. Kids were in the front row and they were having a blast. Girls looked radiant with their colorful hair accessories. Everyone was wearing varied and colorful attires. Women wrapped themselves in their "Melhfa" headscarves, and men, most of them tall and athletic, looked very elegant in their "Daraa" robes. At the end, a big banner denouncing the seizing of resources in the occupied territories was presented to the authorities. Numerous international aid workers were also in attendance, either because they were curious or because they wanted to document the event, just like myself. Many were buying souvernirs to bring back home.